The Apricus FPC-A32 flat plate solar thermal collector is suitable for residential or commercial solar water heating projects. The flat plate collector features a low profile design (80mm / 3.15" profile), which combined with ultra-lightweight melamine foam insulation, makes it one of the lightest flat plate panels per m2 on the market. The TINOX Energy Aluminium absorber sheet absorbs up to 95% of available sunlight converting into usable heat for hot water production. 1981mm / 78" 2444mm / 96"
* Calculated at midday (trans IAM = 1), G=1000W/m2, âˆ†T (tm-ta)=0, TUV report 154027362. Choice of material and design aspects can greatly affect not only the solar thermal performance but also the reliability when operating in many varied environmental conditions. Apricus has chosen only the highest quality materials to ensure reliable, efficient operation and collector longevity. Toughened glass (glazing) protects the absorber from the outside environment while allowing through >90% of sunlight. A thin sheet of Aluminium is coated with a highly selective material that is extremely efficient at absorbing sunlight and converting it into usable heat. The aluminium sheet is ultrasonically welded to the copper riser pipes. The insulation helps reduce heat loss from the sides and back of the collector. Made from ultra-light weight melamine foam this material is chosen to greatly reduce the weight of the collector. An aluminium alloy sheet seals the back of the panel and adds to the rigidity of the collector. 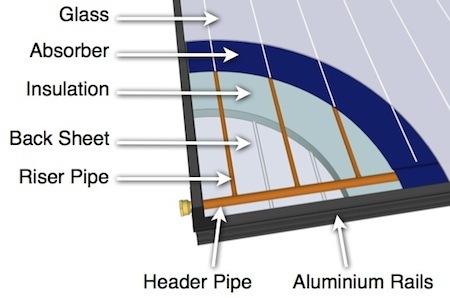 The header and riser pipes are brazed together to form a harp shaped heat exchanger that the solar system heat transfer fluid circulates through. The absorber sheet is ultrasonically welded to the riser pipes, thus transfers heat to the heat transfer fluid. Extruded from high tensile 6063 aluminium alloy, the rails form the outer framework of the collector and are designed with wings for easy mounting frame attachment. Click here to view available product documentation.